Expect your brief literature anthology to do more. 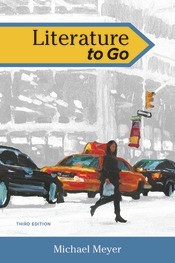 Drawn from our best-selling anthology The Bedford Introduction to Literature, Literature to Go is a brief and inexpensive collection of stories, poems, and plays supported by the superior instruction you expect from a Michael Meyer anthology. With literature from many periods, cultures, and diverse voices, the book is also a complete guide to close reading, critical thinking, and thoughtful writing about literature. The third edition features 66 new, carefully chosen stories, poems, and plays—as well as new art throughout—continuing the anthology’s mission to present literature as a living, changing art form.